Ankita Raina bounced with energy and confidence for nearly three hours to provide a fitting climax for the host, after Karman Kaur Thandi gave a riveting start to India’s hunt to stay in the group against Chinese Taipei in the Fed Cup Asia-Oceania relegation play-off women’s tennis at the DLTA Complex here yesterday. Cheered by an enthusiastic crowd on court No.1, on which she struggled to strike her rhythm initially, Ankita was a picture of superb fitness and mental alertness. The 25-year-old Ankita dictated the climax against the admirable determination and athleticism of Chieh-Yu Hsu for a 6-4, 5-7, 6-1 victory in the second singles that sealed the issue for India. Earlier, 19-year-old Karman Kaur exploded with her big game to wriggle through a tricky phase against Pei-Chi Lee 7-6(4), 6-3 in the first singles, that laid the solid platform for the host. Running hard and hitting with power, precision and imagination, Ankita did not relent throughout the match, even though she was disappointed not to have sealed the contest in straight sets, after having survived two set points in the tenth game of the second set. Eventually, in the decider, it was Ankita who looked rejuvenated with energy as she grounded the Taipei girl, surviving two breakpoints in the first game and running up a 4-0 score that broke all resistance. Ankita did drop serve, but that was an aberration to a heady climax for the host. The brave Chieh-Yu Hsu tried hard like a warrior but had clearly run out of energy in the third set, even as Ankita punched winners all over the court to assert her supremacy. 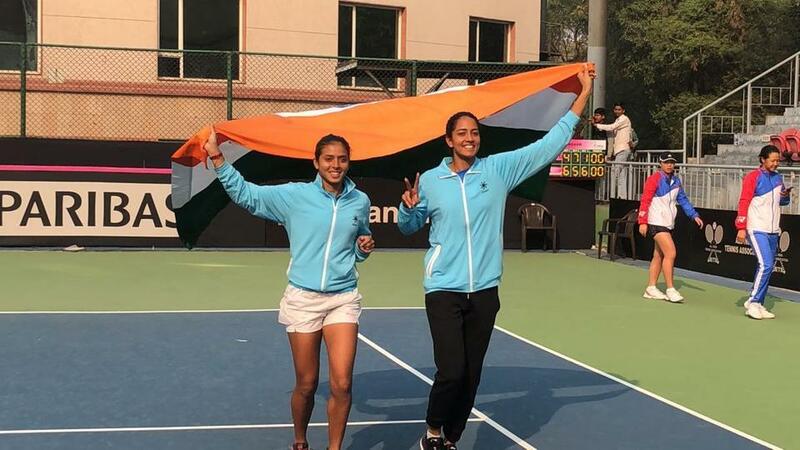 It may take some time for India to think about progress in Fed Cup but there was no doubt that the season ahead is going to be thrilling for Indian women’s tennis, especially for Ankita Raina and Karman Kaur. In the qualification match between group toppers, for the World Group-2 play-off, Japan beat Kazakhstan 2-1 to book the lone berth. Thailand won the other relegation play-off 2-1 to push Hong Kong back into group-2. Relegation play-off: India bt Chinese Taipei 2-0 (Karman Kaur Thandi bt Pei-Chi Lee 7-6(4), 6-3; Ankita Raina bt Chieh-Yu Hsu 6-4, 5-7, 6-1).